My Life Is A Fairytale That Will Never End. : Read-a-thon: Hour 14 Mini Challenge "Share a Quote"
Read-a-thon: Hour 14 Mini Challenge "Share a Quote" - My Life Is A Fairytale That Will Never End. 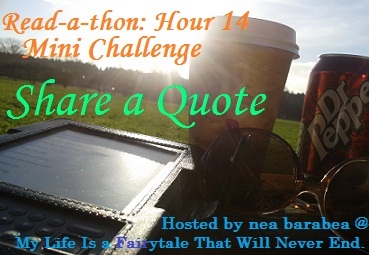 Read-a-thon: Hour 14 Mini Challenge "Share a Quote"
Hello there my pretty readers!! Still away? Hell yes! 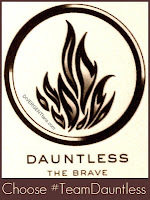 :) It's 3AM here but lets kick this read-a-thon to the fullest. We are more than half way through :) We are awesome and we can do it ;) I'm proud of you! Keep going like this, you are doing great! So, this challenge is about sharing a quote from the book that you are reading or books that you've read during this read-a-thon. I love quotes, so I would really love hear the one that made a big impression on you. Or that you've found it completely hilarious! 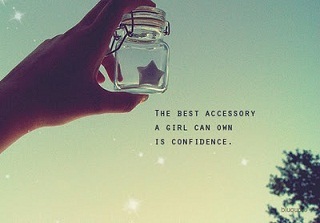 Or that you've simply found it beautiful! Doesn't have to be long or anything. You have time all through read-a-thon to post your quote in the comment section. You can post it on your blog as well, just be sure to leave a link to the post so I can check it out! You can win one of my favourite books so far. It's full of incredible quotes - ones that made a big impression on me, and lots of hilarious ones. And the story is so so good. Here's a quote from my current read, Meant to Be by Lauren Morrill: "I know better than anyone that it's impossible to argue with destiny." This is my very first read-a-thon and I'm having a blast! "Frederick was there- vivid and laughing and tense; it was a miraculous photograph." "This idea, it wrap around me like a warm blanket, it settle my shaking bone, it calm my heart, and I understand. All the time you fighting, you think only of how to survive. All the time you survive, you wonder why you don't die. But now my life can be something different. Now, in America, I don't have to fight. I don't have to survive. I can chose a new thing: to live." I was waiting for this mini challenge all day, I'm so glad that you wanted to include this one, thanks! :) I'm reading "All our pretty songs" by Sarah McCarry and here's the link for the quotation, I hope you find it as endearing and powerful as I did! Here's a quote from Where'd You Go, Berndatte? Such a funny book. "Your mission statement says Galer Street is based on global 'connectitude.' (You people don't just think outside the box, you think outside the dictionary!)" It's past midnight here but I'm still going! I hope you're still feeling quite fresh and spirited! Hello, Nea! I'm impressed that you are awake at 3 AM! I am having so much fun with my first Read-a-Thon, although I must say that I never realized how slowly I read until I see everyone else has knocked out 3, 4, or more books. I'm still working on my second! My quote is from School Spirits by Rachel Hawkins, and I hope it gives everyone a little chuckle. "But underlying that thought was how much easier life would be if she stayed solitary. If you didn’t put all of yourself into loving someone else, you could never get hurt by them." Love this mini-challenge. Here is my link to my favorite quote from "Wonder"
(..) thinking that if people were rain, I was drizzle and she was hurricane"
I'm currently reading Splintered by A.G. Howard and am really enjoying it. It has grabbed me from the first page.."I've been collecting bugs since I was ten; it's the only way to stop their whispers. Sticking a pin through the gut of an insect shuts it up pretty quick"
" I have heard that if lovers meet a pig while walking, it is certain to doom their love. If only I could arrange for them to meet a pig. Or even better a weasel." Thank you for hosting - LOVE quotes, LOVE this challenge! Please stop by and share your thoughts! I absolutely Loved Losing It!! It was my first real read for New Adult. "Going outside is highly overrated." Love this challenge :) It's just 10pm here now. The quote I picked is kind of long so there's a picture of it on my blog. I didn't even think about this being an option for a challenge, I just snapped the pic because the quote stuck with me. "If you read naively, as I mostly do, to make sense of your life, rather than for more sophisticated aesthetic or scholarly reasons, then certain writers inevitably become your own Fluchthelfer, helping you over your own walls, whether to escape reality or, as I prefer to see it, to find your way into it." I'm loving the read-a-thon. I hope you're having fun too! "Kill them. Kill them now. no-one will know. No-one need ever know. Kill them out amongst the rocks and the cold and the snow and the darkness and their bodies will never be found. Not ever. You won't get caught. You can do it. You want to do it. DO IT!" the New Zealand start time was 1am & having had a tiring day, missed the start but I'm making a little progress in my first book in this hour. "He turned and ran across the flat, sun-scorched earth so quickly that he sent up a cloud of dust. It seemed to pursue him as he got smaller and smaller and eventually disappeared into it." Sometimes it's better if you don't try to guess what's coming; you'll prepare yourself for the familiar and the unexpected will run you through before you realize you guessed wrong. "I was woken by a shell-burst in the trench of sleep. Heart skipping, with eyes fighting light, my thoughts sprang up like a field of starlings startled by a farmer's gunshot, a thousand separate, autonomous specks that swirled into a single united black shape." Isn't that just the most perfect description of a noise waking you up suddenly? "Trains howl away across the valley. The sun goes down long and red. All the magic names of the valley unrolled Manteca, Madera, all the rest. Soon it got dusk, a grapy dusk, a purple dusk over tangerine groves and long melon fields; the sun the color of pressed grapes, slashed with burgundy red, the fields the color of love and Spanish mysteries." One of my favorite quotes from a middle grade fiction book. Thanks for the lovely challenge. Hope you had a fabulous readathon!